If it was a little later in the season, all the vegetables except the corn would be from my garden. 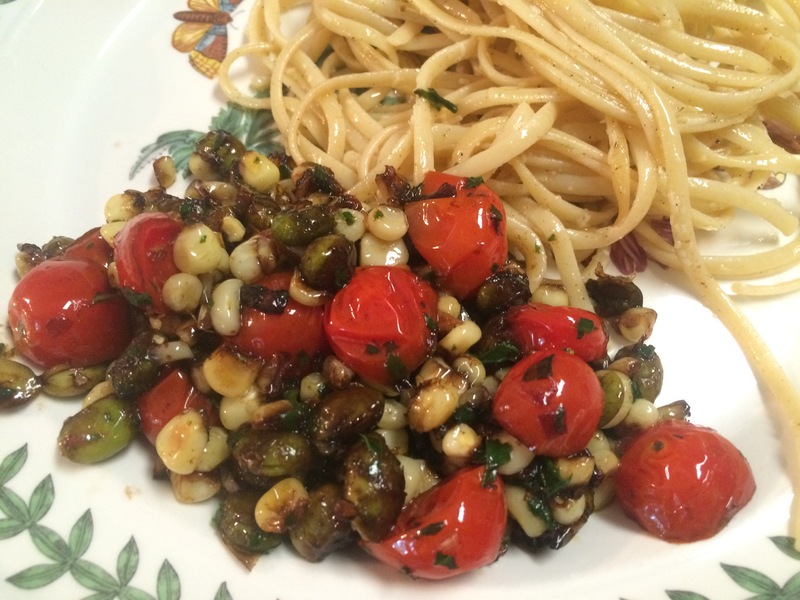 But I couldn’t wait that long, so the corn is from Preston, Maryland, the tomatoes from Highland Orchards, the edamame is frozen, but the scallions and basil ARE from my garden. This is such a colorful dish, with richness of flavor to match the colors. We initially had the pasta and vegetables separated, I am including that picture since it shows the vibrant colors off best. But the two dishes begged to be combined, and combine them we did. Perfect! Thus the adaptation I am presenting here. That, plus my use of less basil oil and heavier balsamic in the vegetables themselves. Bring a large pot of salted water to boil and cook linguine according to package directions. Drain. Meanwhile, bring a small pot of water to a boil. Add basil; cook 10 seconds. Transfer basil to a bowl of ice water, then drain, and squeeze dry. Puree basil, 2 Tbsp oil, and 1/4 teaspoon salt in a blender or food processor until smooth. (I ended up using my spice grinder, it worked the best). 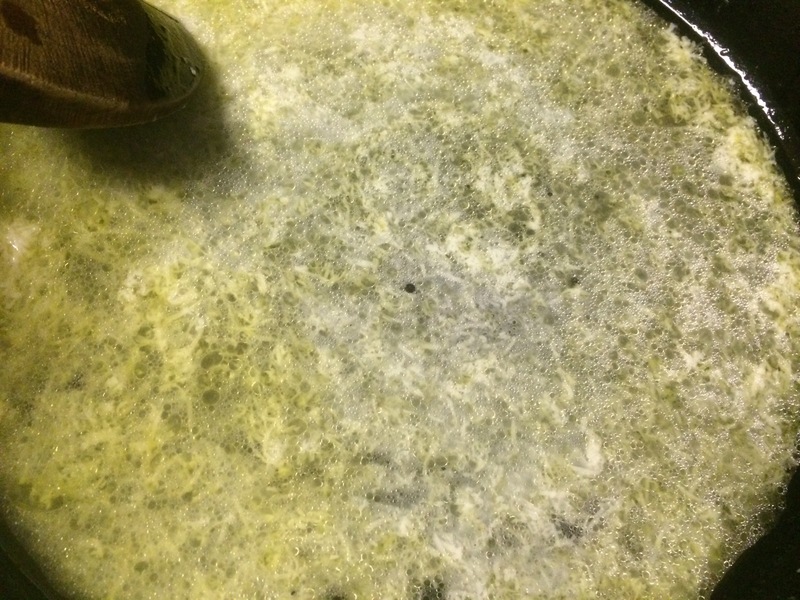 While the pasta water is heating or pasta cooking, heat remaining oil in a skillet over medium-high heat. Add scallions and garlic; cook until fragrant, about 30 seconds. 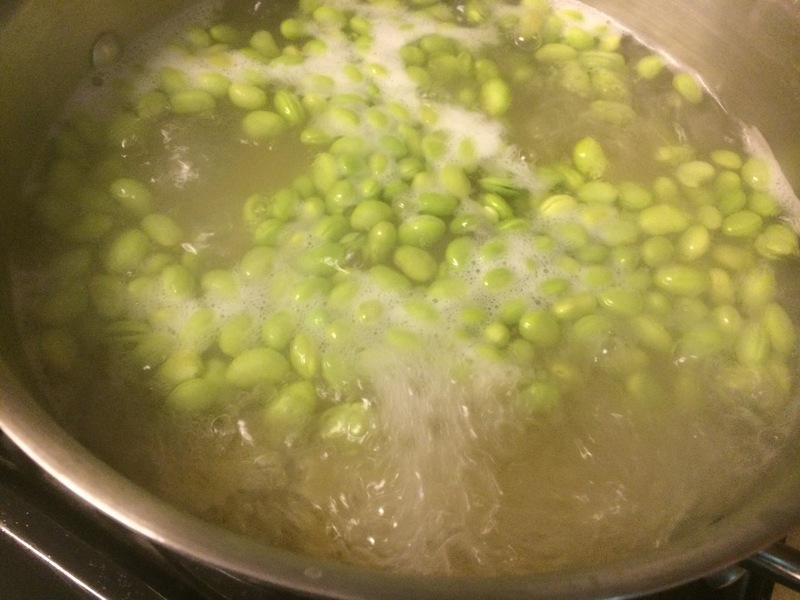 Add corn, edamame, and remaining salt. Cook, stirring, until starting to caramelize, about 10 minutes (reduce heat to medium if overbrowning). Add tomatoes and vinegar; cook until tomatoes start to collapse, about 8 minutes. Drizzle basil oil on vegetables, and stir. 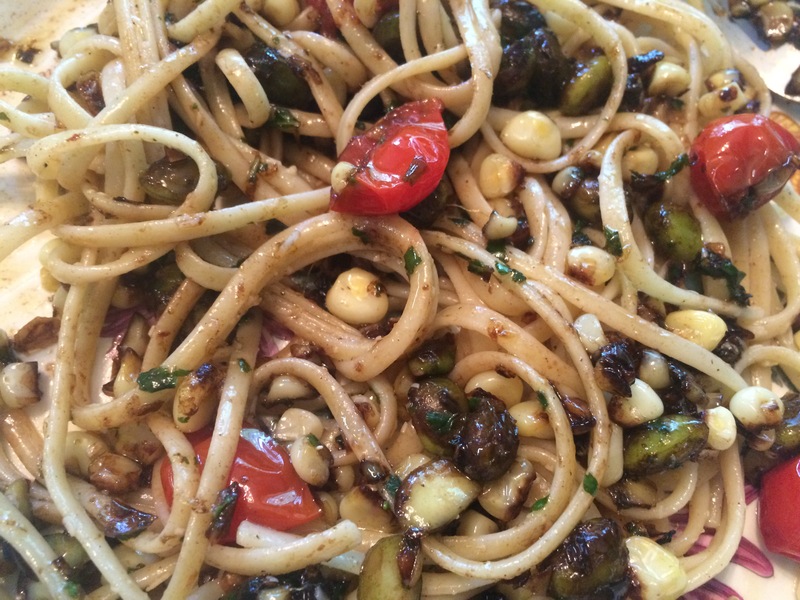 Toss the pasta with the vegetables. Serve and enjoy!. 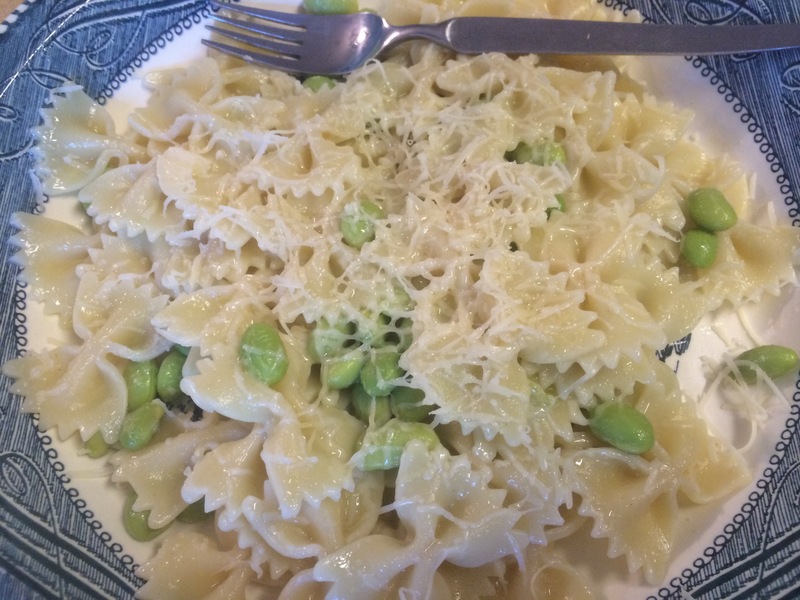 Pasta, edamame, lemon and parmesan. So simple, yet tasty and quite satisfying. What more is there to say? 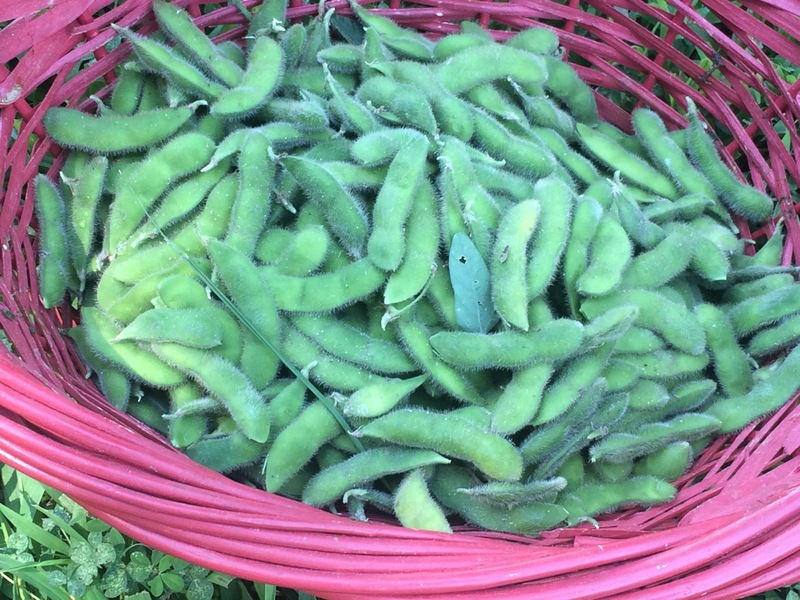 Except…look at my beautiful edamame harvest! Cook the pasta in salted water according to package directions. In the last 5 minutes of cooking time, add the edamame. Reserve 1/3 of the pasta water and drain. Place the lemon zest and juice in a large skillet over medium heat. Add the reserved pasta water, oil and 1/2 cup of the cheese. Mix well. 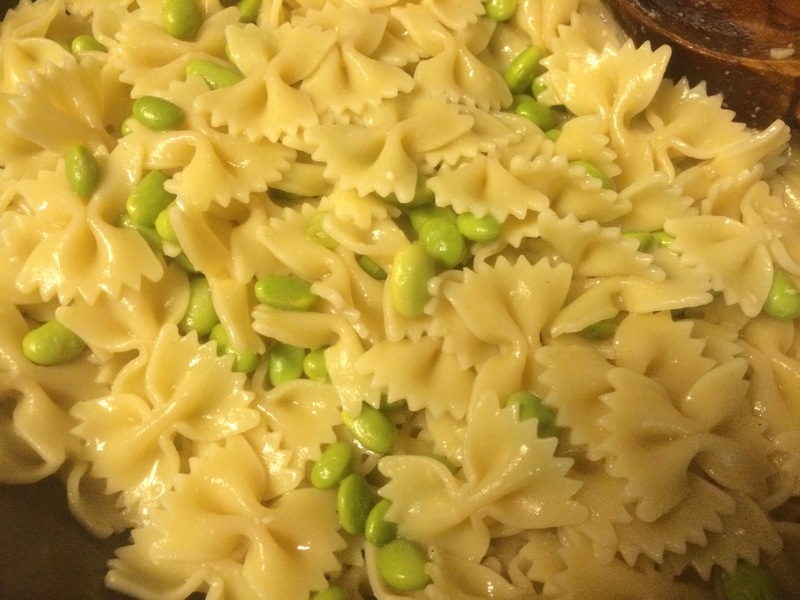 Add the edamame and farfalle to the lemon mixture, and toss well to coat. Serve immediately, sprinkled with remaining cheese. Season with pepper to taste. Serves 6. Spring has finally arrived in Delaware! And with it, the ability to get my garden tilled and ready for the main spring planing. My husband spent the afternoon enjoying the sunshine while the tiller shook his arm so much that his fitbit thought he did 27,000 steps! While he was busy in my garden (ok, our garden), I accompanied Cam to his first official race, a 1/4 mile race for kindergarteners and 1st graders. Part of the Healthy Kids Running Series – what a great event this was. He absolutely loved it. And announced that he would practice running in our neighborhood so he can get faster. Spring also means that my local farm market is now open, so I now had green beans and asparagus from Fifer Orchards. I decided to combine them with some edamame I had in the freezer and baby spinach as a side dish to have with our dinner. 2 minutes, or until the scallion softens. 2 minutes, or until the beans and peas are heated through. Add the spinach and sauté for about 2 minutes, or until the spinach wilts and the asparagus is crisp-tender. Stir in the lemon zest and juice. Season to taste with salt and pepper. Transfer to a serving platter. Serve immediately and enjoy!